For example, ordinary ice is called ice Ih, because it has hexagonal crystals. But if you cool it below -37 °C, scientists believe it will gradually turn into a cubic form, called ice Ic. 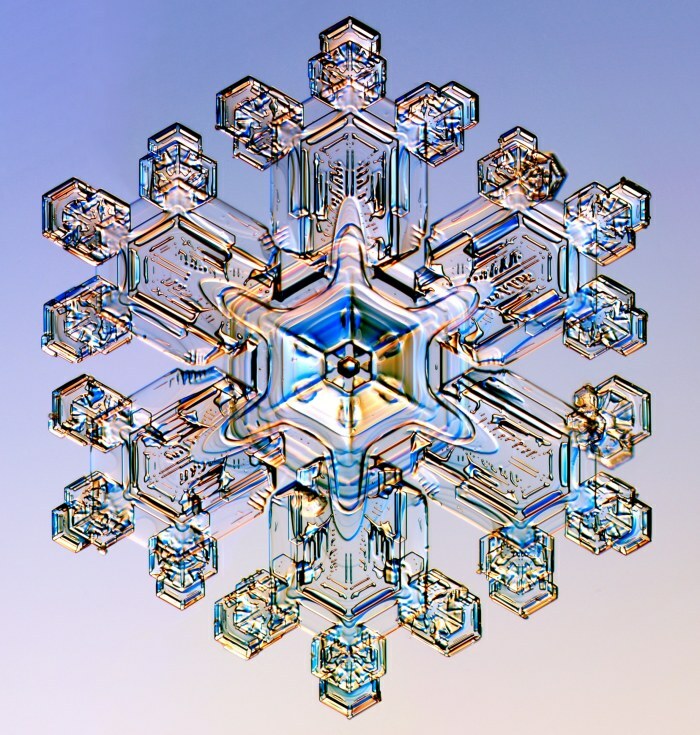 In this form of ice the water molecules are arranged like carbons in a diamond! And apparently some of it can be found in ice crystals in the stratosphere. But if you wait longer, ice below -37 °C will turn into ice XI. The transformation process is slow, but ice XI has been found in Antarctic ice that’s 100 to 10,000 years old. This ice is ferroelectric, meaning that it spontaneously become electrically polarized, just like a ferromagnet spontaneously magnetizes. • Simon Hadlington, A question mark over cubic ice’s existence, Phys.org, 9 January 2012. Analysis of the diffraction data shows that in the ice crystals the stacking of the atomic layers is disordered. “The crystals that form have randomly stacked layers of cubic and hexagonal sequences,” Murray says. “As each new layer is added, there is a 50% probability of it being either hexagonal or cubic.” The result is a novel, metastable form of ice with a stacking-disordered structure. There’s a lot of fun math here. First focus on the oxygen atoms, in red. What sort of pattern do they form? It’s not flashy, but it helped me understand something that had been bothering me for decades! This is truly beautiful stuff: part of the geometry of nature. But I’ll explain ice Ih from scratch—and while I’m at it, ice Ic. Then you put down a second hexagonal layer of balls. You might as well put them in the spots labelled ‘b’. There’s another choice, but the symmetry of the situation means it doesn’t matter which you pick! This gives you the hexagonal close packing. This gives you the cubic close packing. You just can’t repeat the same letter twice in a row! As you can see, there’s a ball at each corner of a cube, but also one at the middle of each face. That’s why this pattern is also called a face-centered cubic. And to my eye, they look uglier—they’re less symmetrical. As each new layer is added, there is a 50% probability of it being either hexagonal or cubic. I’m guessing that means that at each layer we randomly make either of the two choices I mentioned. I’m not completely sure. My guess makes the most sense if the ice is growing by accretion one layer at a time. But there’s more to ice than close-packed spheres. If we ignore the hydrogen atoms and focus only on the oxygens, the two kinds of ice we’re talking about—the hexagonal ice Ih and the cubic ice Ic, assuming it exists—are just like two kinds of diamond! This pattern is called a diamond cubic. 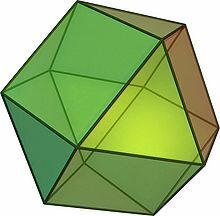 We can get it by taking the cubic close packing, making the balls smaller, and then putting in new ones, each at the center of a tetrahedron formed by the old ones. I hope you can see this. 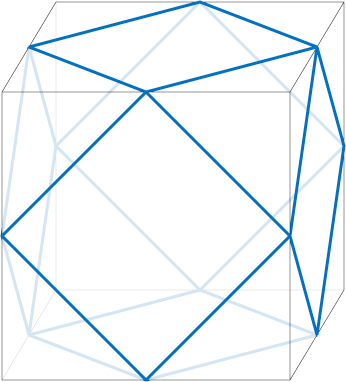 There’s a ball at each corner of the cube and one at the center of each face, just as we want for a face-centered cubic. But then there are are 4 more! But what about good old ice Ih? Here the oxygens are arranged in the same pattern as carbons in a hexagonal diamond. You’ve heard about diamonds, but you might not have heard about hexagonal diamond, also known as lonsdaelite. It forms when graphite is crushed… typically by a meteor impact! It’s also been made in the lab. 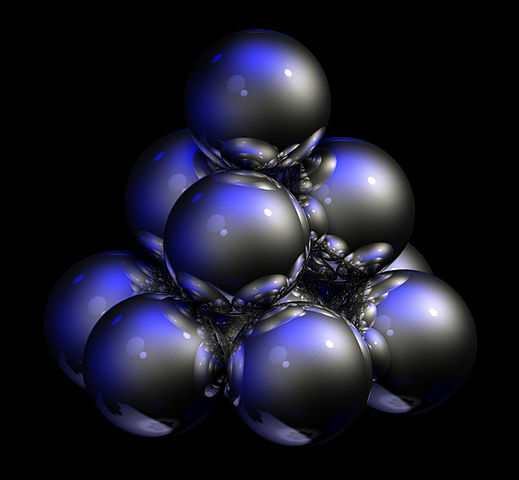 We get this pattern by taking a hexagonal close packing, making the balls smaller, and then putting in new ones, each at the center of a tetrahedron formed by the old ones. Again, I hope you can see this! But what about the hydrogens? They’re very interesting: they’re arranged in a somewhat random way! Pick any oxygen near the middle of the picture above. It has 4 bonds to other oxygens, shown in green. But only 2 of these bonds have a hydrogen near your oxygen! The other 2 bonds have hydrogens far away, at the other end. There are many ways for this to happen, and they’re all allowed—so ice is like a jigsaw puzzle that you can put together in lots of ways! So, even though ice is a crystal, it’s disordered. This gives it entropy. Figuring out how much entropy is a nice math puzzle: it’s about 3/2 times Boltzmann’s constant per water molecule. Why? Rahul Siddharthan explained this to me over on Google+. Here’s the story. 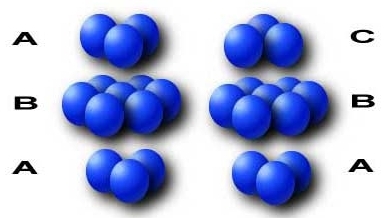 The oxygen atoms form a bipartite lattice: in other words, they can be divided into two sets, with all the neighbors of an oxygen atom from one set lying in the other set. You can see this if you look. allowed configurations of hydrogens for this oxygen atom. 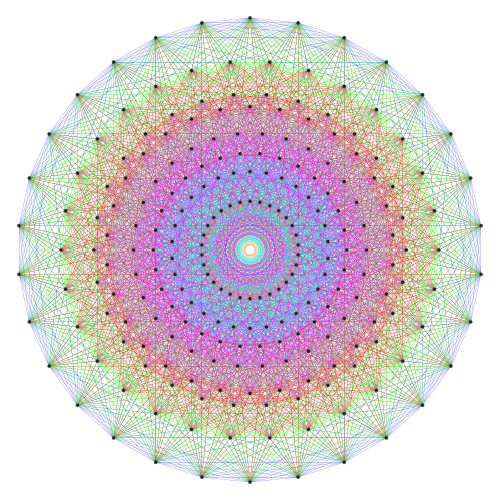 Thus there are configurations that satisfy these atoms. where is Boltzmann’s constant. This gives an entropy of 3.37 joules per mole per kelvin, a value close to the measured value. But this estimate is ‘naive’ because it assumes the 6 out of 16 hydrogen configurations for oxygen atoms in the second set can be independently chosen, which is false. More complex methods can be employed to better approximate the exact number of possible configurations, and achieve results closer to measured values. By the way: I’ve been trying to avoid unnecessary jargon, but this randomness in ice Ih has such a cool name I can’t resist mentioning it. It’s called proton disorder, since the hydrogens I’ve been talking about are really just hydrogen nuclei, or protons. The electrons, which form the bonds, are smeared all over thanks to the wonders of quantum mechanics. • Martin Chaplin, Water phase diagram. • Norman Anderson, The many phases of ice. Click for an even more impressive image of the whole thing. How does it work? 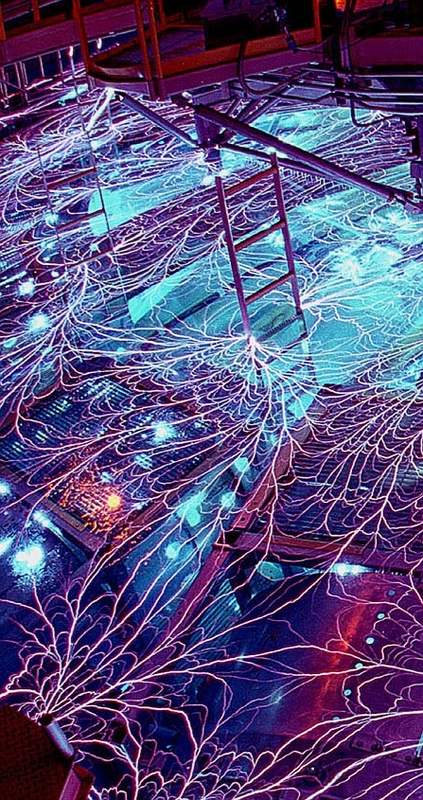 It fires a very powerful electrical current—about 20 million amps—into an array of thin, parallel tungsten wires. For a very short time, it uses a power of 290 terawatts. That’s 80 times the world’s total electrical power output! The current vaporizes the wires, and they turn into tubes of plasma. At the same time, the current creates a powerful magnetic field. This radially compresses the plasma tubes at speeds of nearly 100,000 kilometers per hour. And this lets the mad scientists who run this machine study materials at extremely high pressures. But now the Z Machine is making far more compressed forms of ice. Above 1 million atmospheres, ice X is stable… and above 8 million atmospheres, a hexagonal ferroelectric form called ice XI comes into play. This has a density over 2.5 times that of ordinary water! • Experiments may force revision of astrophysical models: ice giant planets have more water volume than believed, Science Daily, 19 March 2012. 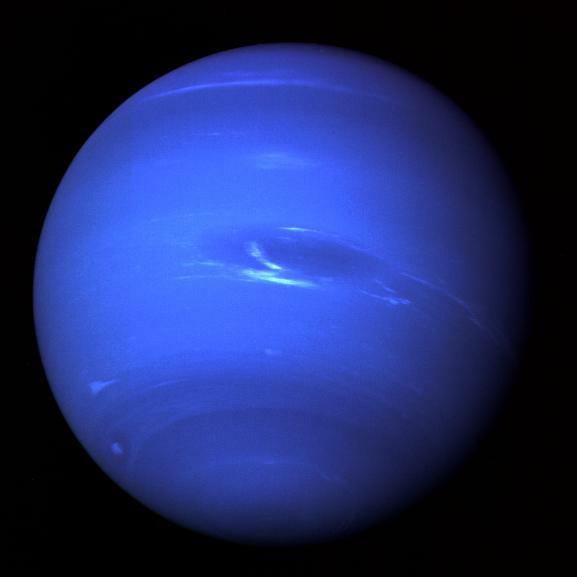 While it’s named after the Roman god of the seas, and it’s nice and blue, Neptune’s upper atmosphere is very dry. However, there seems to be water down below, and it has a heart of ice. A mix of water, ammonia and methane ice surrounding a rocky core, to be precise! But the pressure down there is about 8 million atmospheres, so there’s probably ice X and ice XI. And if that ice is less compressible than people thought, it’ll force some changes in our understanding of this planet. Not that this matters much for most purposes. But it’s cool. And if you don’t love math, this might be a good place to stop reading. Okay… if you’re still reading, you must want more! And having wasted the day on this post, I might as well explain a bit of the math of the crystal structures I described. I’ll want to someday; it might as well be now. That way, you can see this lattice has the group of permutations of 4 letters as symmetries. Not coincidentally, this is the symmetry group of the cube. Note that they all have the same length and each lies at a 120° angle from the previous one, while the first and last are at right angles. This seems like an ugly choice, but note: they all have the same length and each lies at a 120° angle from the previous one, while the first and last are at right angles. So, we know it’s the A3 lattice! 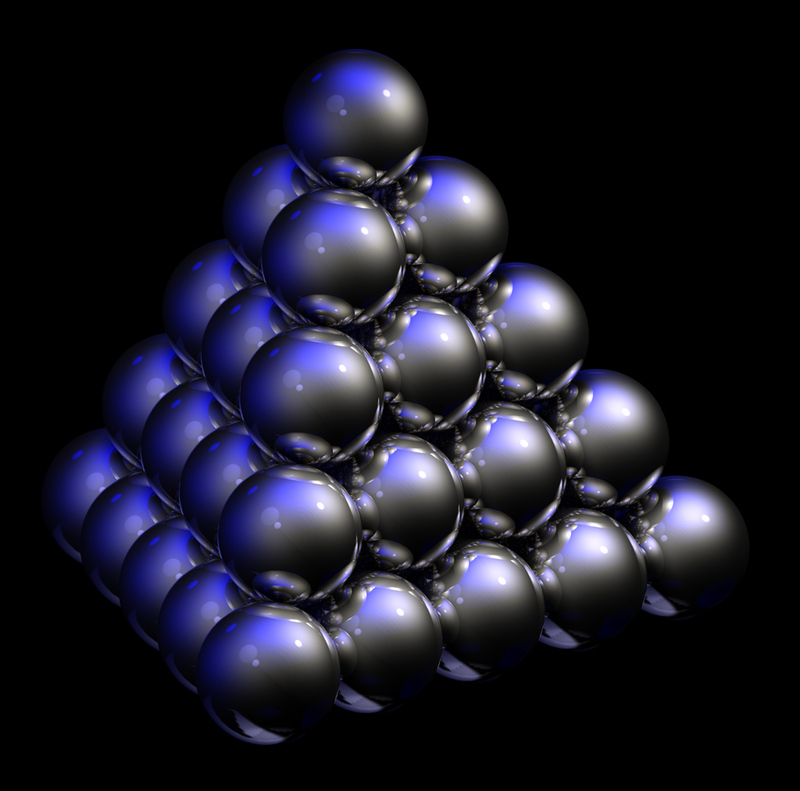 Below we see that in the hexagonal close packing each ball also touches twelve others, but centered at the vertices of a mutant cuboctahedron whose top has been twisted relative to its bottom. This shape is called a triangular orthobicupola. 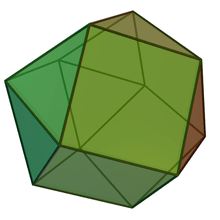 The diamond cubic is not a lattice. We can get it by taking the union of two copies of the A3 lattice: the original lattice and a translated copy. For example, we can start with all vectors with integer coefficients summing to an even number, and then throw in all vectors This is called the D3+ pattern. This is why ordinary ice actually becomes denser when it melts. It’s not packed in the diamond cubic pattern: that would be ice Ic. Ordinary ice is packed in a similar pattern built starting from the hexagonal close packing! 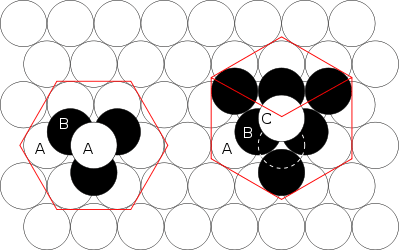 But the hexagonal close packing looks just like the cubic close packing if you only look at two layers… so this similar pattern gives a packing of balls with the same density as the diamond cubic. Dn+ is only a lattice when the dimension n is even! When the dimension is a multiple of 4, it’s an integral lattice, meaning that the dot product of any two vectors in the lattice is an integer. It’s also unimodular, meaning that the volume of the unit cell is 1. And when the dimension is a multiple of 8, it’s also even, meaning that the dot product of any vector with itself is even. Now, D8+ is very famous: it’s the only even unimodular lattice in 8 dimensions, and it’s usually called E8. In week193, I showed you that in the packing of balls based on this lattice, each ball touches 240 others. It’s extremely beautiful. But these days I’m trying to stay more focused on the so-called ‘real world’ of chemistry, biology, ecology and the like. This has a beauty of its own. 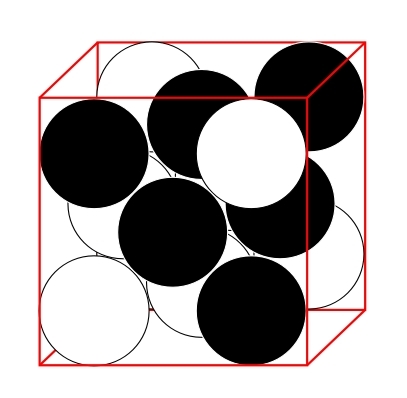 In 3 dimensions, D3 = A3 is the face-centered cubic. D3+ is the diamond lattice. So, in a way, diamonds come as close to E8 as possible in our 3-dimensional world. 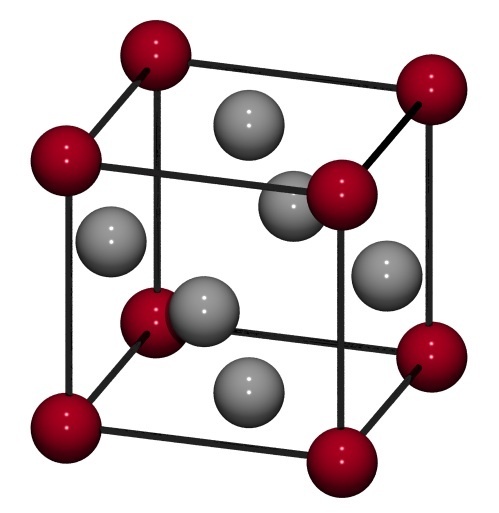 The diamond cubic may seem mathematically less thrilling than E8: not even a lattice. Ordinary ice is even more messy. But it has a different charm—the charm of lying at the bordeline of simplicity and complexity—and the advantage of manifesting itself in the universe we easily see around us, with a rich network of relationships to everything else we see. This entry was posted on Sunday, April 15th, 2012 at 10:21 am and is filed under astronomy, chemistry. You can follow any responses to this entry through the RSS 2.0 feed. You can leave a response, or trackback from your own site. In a more “Perspective” way one would probably prefer to write (a/d) + (b/d) + (c/d) + 1 = 0. But then again, we are still missing 5 out of 3 combinations (2 raised 3), not to mention the original 3 out of 16 (2 raised 4), so a second projection seems to be lurking somewhere. Should we write this as a/d and b/d divided by 1+(c/d)? By the way, you can click on any picture to see its souce and learn more about it. I would also like to see nice mathematical descriptons of the lattice for the hexagonal close packing and the pattern of oxygen atoms in ice Ih (or in other words, the carbon atoms in lonsdaelite). Two other – maybe not so serious ;-) – interesting modifications of water are Ice-9 (I once had a complex systems student give a talk on physics and literature, specifically about Kurt Vonnegut’s “Cat’s Cradle”. We had a very interesting discussion about what would actually happen if Ice-9 with such properties existed.) and the “industrial tomato”. One thing I learned from the Ice-9 talk was that similar things indeed do exist. Specifically, there now are at least two known drugs that have thermodynamically more stable forms than the desired one which autocatalytically cause the desired form to transform into the undesirable one. Weird stuff. Self-replicating chemicals are not merely hypothetical: since Cat’s Cradle, scientists have discovered some real-world example of crystals that seed the environment, converting other forms (polymorphs) of the crystal into their own. The population of the original polymorph diminishes as it is converted into the new form: it is a “disappearing polymorph.” In 1996 Abbott Labs began manufacturing the new anti-AIDS drug ritonavir. In 1998 a more stable polymorph appeared in the American manufacturing plant. It converted the old form of the drug into a new polymorph, Form 2, that did not fight AIDS nearly as well. Abbott’s plant was contaminated, and it could no longer manufacture effective rintonavir. Abbott continued to successfully manufacture the drug in its Italian plant. Then American scientists visited, and that plant too was contaminated was contaminated and could henceforth only produce the ineffective Form 2. Apparently the scientists had carried some Form 2 crystals into the plant on their clothing. That’s really cool, Thomas! Vonnegut’s ice IX is very unlikely to exist, because the world is large and wet, so if there were a form of water more stable than liquid water at room temperature and pressure, random fluctuations would probably have made a little seed of it by now. I use the same type of argument to reassure myself that the Relativistic Heavy Ion Collider or Large Hadron Collider is unlikely to knock our vacuum into a more stable state that expands at the speed of light and destroys the Universe as we know it. But Ritonavir is new and rare, so my argument does not rule out the—still impressive—story you pointed out. Apotex, a generic drug manufacturer, was all set up to manufacture the off-patent anhydrous generic Paxil when it discovered small fractions of it were being converted into the hemihydrate. They couldn’t remove the contamination. SmithKline, owner of the patent on the hemihydrate, sued them for patent infringement. Apotex argued that the hemihydrate form occurred naturally, so that SmithKline’s patent was invalid. SmithKline argued that it was a disappearing polymorph, that the hemihydrate form had not existed before they had created it in their labs, and that it was up to Apotex to remove the hemihydrate from its product or pay it a royalty. Apotex was unable to remove the hemihydrate and unwilling to pay a royalty. Judge Richard Posner heard this case in the trial court and wrote an opinion that contains a good explanation of the self-replicating Paxil controversy. The Federal Circuit heard the appeal and decided that SmithKline’s patent on the hemihydrate was invalid as “inherently anticipated” because anhydrate naturally converts into hemihydrate. Normally, anticipation would require an actual reference describing the claimed chemical structure (in patent lingo that the hemihydrate was “taught in the prior art”). But Judge Rader held that inherent anticipation occurs when, more likely than not, an operation that is taught in the prior art would result in the claimed chemical. The anhydrate which was taught in the prior art would more than likely result in natural creation of some hemihydrate. Judge Gajarsa in concurrence argued that the drug was discovered not invented, making it unpatentable subject matter. Gajarsa’s opinion may have inspired the United States Supreme Court to raise the subject matter issue on its own (i.e., it had not been argued by the parties to the case) in Metabolite. The Supreme Court is considering whether to take the appeal on the self-replicating Paxil case as well. But if you cool it below -37 °C, scientists believe it will gradually turn into a cubic form, called ice Ic. “Scientists believe?” Is there something going on here that’s impossible to test? If you venture beyond the first paragraph, your question will be answered. And believe it or not, scientists do believe things. Some are confirmed, some are disconfirmed. One would assume they either know or do not know. Pretty pics, though. Scientists are people too….and they believe in stuff just like normal people. Not everything HAS to be proven by evidence. Blown your bubble? Knowledge only comes at the very end. When it comes to ice, we’re still midstream. The conventional beliefs on ice Ic may have been overturned by better experiments at the atomic level last year. But I’d wait for more confirmation before making any definitive claims. Great post! And those “disappearing polymorph” stories are amazing. Whoops, thanks for catching those mistakes! I’ll fix them now. I have some trouble telling what people will like. I started writing this mainly to get a bunch of Google+ posts into one place. Then I started organizing the story and throwing in other stuff I knew, and I spent a whole day on it. I wrote the final section feeling a bit guilty for rambling on endlessly and becoming too technical. But people on Google+ loved the original chart showing phases of water, so there must be something about this subject that people like… not just me. As a lay person I found your tutorials and explanations very clear and concise. The stories of real world applications were also very well done. I for one applaud your day of work it has added to my life and understanding of this wonderful world we live in. Thanks! It’s a wonderful world, all right. FYI, you’ve been linked on “Hacker News” (http://news.ycombinator.com/item?id=3844309), and maybe other sites (? ), hence the peak I believe (I myself saw this post there). There is one other very common substance besides water than gets denser when it melts: carbon. Since all the interesting phase transitions take place at over 3000K, they’re not quite as well exploted as for ice, but I understand they’re thought to be similarly complex, which is no great surprise. We already know carbon can arrange itself in many different ways. There is one other very common substance besides water than gets denser when it melts: carbon. That’s interesting! What happens when you heat a diamond at standard atmospheric pressure in an oxygen-free environment? Does it first turn to graphite and then melt, getting denser as it melts? Or does it just melt, getting denser as it melts? I could look this up but I’m starved for conversation on this topic. Thousands of people looked at this page and practically nobody said anything interesting about it! 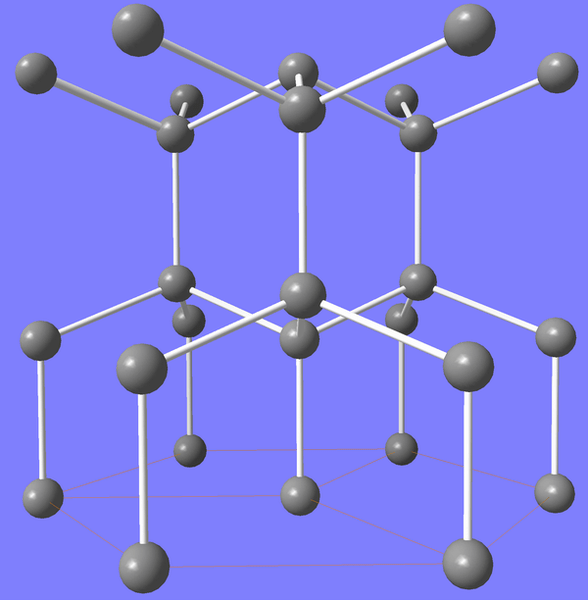 In particular, I’m curious if the very loose diamond cubic structure is responsible for the phenomenon you describe, because that structure is very similar to (the hypothesized) ice Ic. If the melting point decreases with increasing pressure, the liquid is denser than the solid. On theoretical grounds, it’s expected that for all substances, the melting point increases without bound as the pressure increases, for sufficiently large pressures, assuming no chemical transformations. Normally, the phase boundaries don’t go vertical – the slope only changes sign at triple points – because going vertical implies the two phases have the same density. Looking at that diagram, the melting point has only just started to increase from its minimum at 70 GPa. There are expected to be multiple allotropes above that point, with an eventual transition to a metal structure. It’s not known if the fullerene and linear (alternating single/triple bonds) structures are thermodynamically stable under any conditions. Somewhere off that chart, there’s also the upper critical point of the liquid-gas transition. My understanding is that you’re right about the role of the loose diamond cubic structure in this, but I’m not an expert in the field, just an interested amateur, so I may not be up to date. Thanks for that phase diagram! 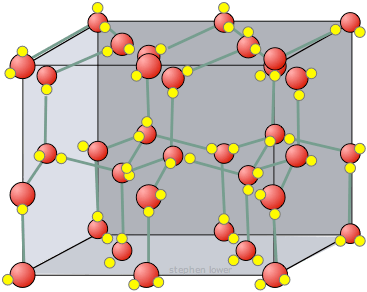 I’ve been meaning to cobble together some Google+ posts into an article on allotropes of carbon, and I’ll incorporate this information into that. ‘m curious about that “Solid III” near the top of the diagram. I’ve heard there are (at least) 3 known high-pressure solid phases of carbon; this must be one. But I don’t know much about them! There is also reason to believe that both carbon and water may have multiple liquid allotropes: http://cs-test.ias.ac.in/cs/Downloads/article_34041.pdf cites experimental evidence for phosphorus, and lists carbon, water, and other chemicals with the same diamond-type structure as probable candidates. Information is scare on the high pressure allotropes of carbon, since both experiments and ab inito calculations are difficult. One obvious step is to compare the other elements in the same group, all of which have an allotrope with the diamond structure, but a quick check shows the phase diagram of silicon is obscure: http://www.ifisc.uib.es/gefenol/FisEs/05/Program/PDF/p61.pdf – which mentions six phases with unclear boundaries. Tin has a diamond-metal transition at near ambient conditions, and other allotropes too, but I can’t find any phase diagrams at the moment. I explained the face-centered cubic lattice in my recent post about ice. Now let’s look at the body-centered cubic. But I’d think that it would give the same density as a cubic packing, since if you look at 2 halves of layers they give the same density, and you can connect any 2 together(either cubic or hexagonal) so I’d expect the same density.. If you look at the pictures above, you can see that the latter two packings have much lower densities that the first two. Hales’ proof is a hundred pages of writing together with about 3 gigabytes of computer calculations. If we wrote out those calculations in a text file, they’d fill about 2 million pages! But this estimate is ‘naive’ because it assumes the 6 out of 16 hydrogen configurations for oxygen atoms in the second set can be independently chosen, which is false. More complex methods can be employed to better approximate the exact number of possible configurations, and achieve results closer to measured values. Did they do time series also at constant temperature ? But then since the volume stays the same, where would the work come from? By sucking heat from the oil bath? What one could also think of is that the particles may exchange positions without volume change but that the average acceleration per surface of the particles slows down/gets smaller with increasing entropy, i.e. there could eventually be a need for a term with a pressure differential . This goes eventually somewhat into the direction of what amarashiki was sort of thinking of, if one thinks of p as some average ?? A common mistake. I’ll fix it. Thanks but, as far as I had noticed I had fixed that already in the second comment, but there was still a problem, the problem might have been that I had placed smaller and bigger signs as brackets for indicating an average.